Image courtesy of vikings.com via vikingsterritory.com. MINNEAPOLIS, MN – Chad and Jenni Greenway hosted their 9th Annual Gridiron Gallop at Lake Nokomis on Father's Day, June 21st. The event featured a Kid's Fun Run and a 5K Run/Walk. Following the 5K, runners' names were drawn for prizes and awards were presented to the best runners in each age division. The event asks for participants to do something healthy with or in memory of Dad this Father's Day, and that's just what Greenway and fellow runners did. “Father’s Day, this is the day for us,” Greenway said. “This is the day we hang our hat on as dads. So (after the 5K run) I’m going to coach two baseball games – both my older ones play baseball. And that’s what it’s all about." Proceeds from the event will help Minneapolis Parks & Rec. provide athletic programs for kids and youth. 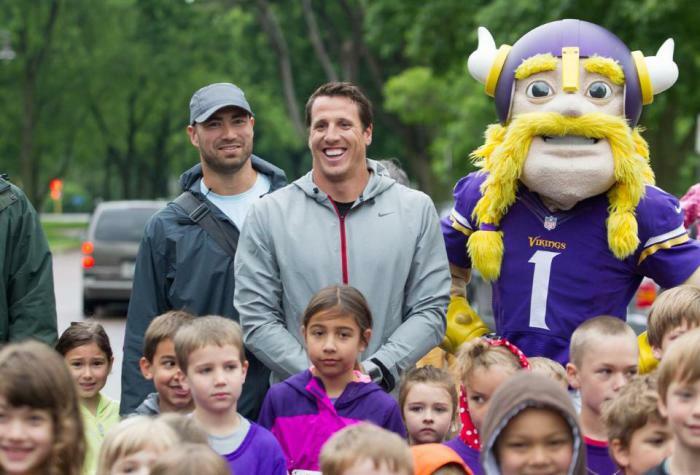 The mission of Chad Greenway’s Lead the Way Foundation is to enrich the lives of individuals and families in need. Its primary focus is to provide critically and chronically ill children throughout the Greater Twin Cities with daily support and life-changing experiences. Learn more at www.chadgreenway.org.